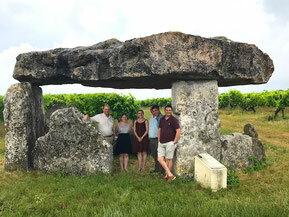 Day 7, part 2 (Tuesday) - After a quick look at a very old but impressive dolmen, (a type of megalithic tomb) located in the middle of a field only a few miles from the Fillioux home, we had a longer-than-expected drive from Cognac to Armagnac. 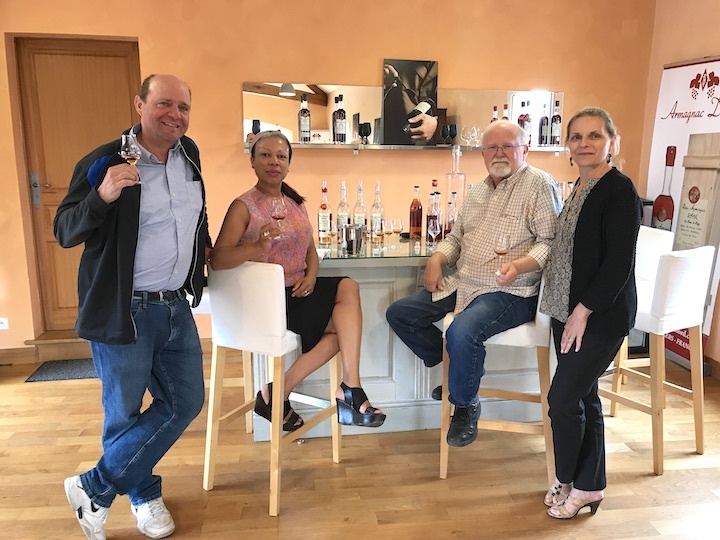 Despite the two-hour delay caused by an overturned truck in Bordeaux, we arrived in time to meet and eat with Jean-Philippe and his wife Susie at Armagnac Artez. The sun hadn’t quite set, so we had an opportunity to view Jean-Philippe’s garden full of Grande Absinthe plants, of which he only uses the baby leaves to make his highly-rated Absinthe La Muse Verte. 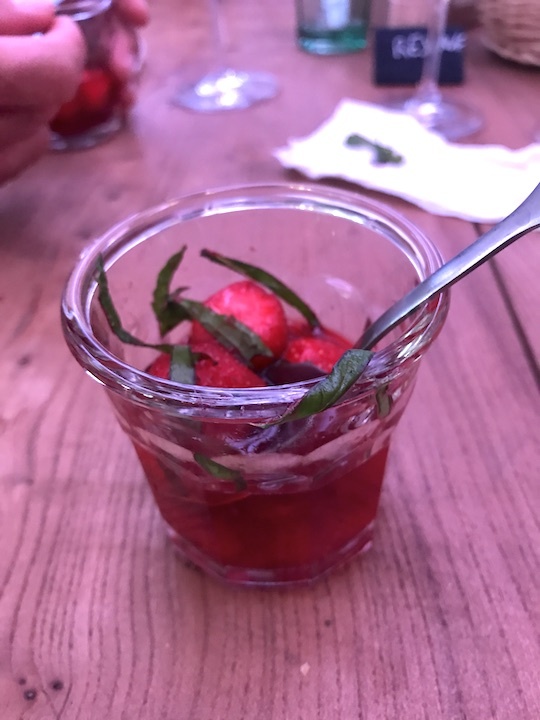 Susie had prepared a wonderfully appetizing dinner that began after we tasted several aperitif variations of the house: pastis and absinthe. The dinner started with Foie gras on toast with chutney, duck breast with ratatouille, home-made French cheesecake, and finally a tasting of a new Armagnac specialty spirit, still in the works, and a wonderful Bas Armagnacs 1995, the first ever single vintage single barrel released by Artez. 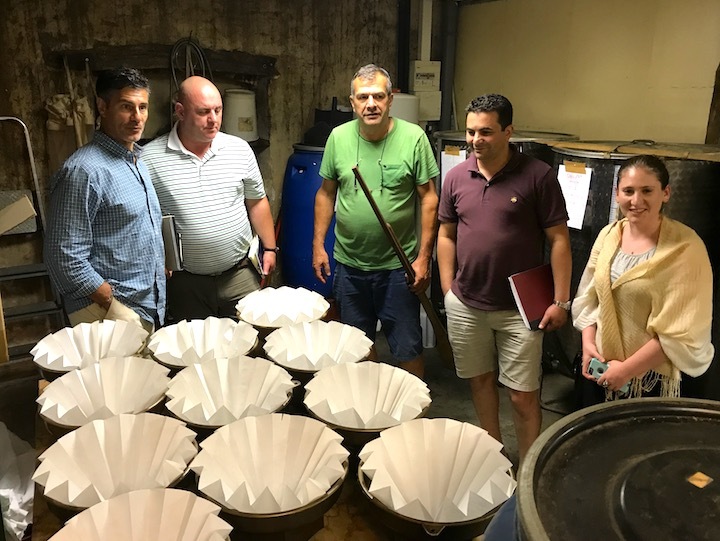 As late as it was getting, we still took time for a look at the absinthe lab where the group had a good laugh at the extra large coffee filters that are used to strain the absinthe in its final stage before bottling. If this is not "artisanal," what is? We were only 30 minutes from our hotel on a clear, but pitch-black moonless night, driving on twisted roads that were not much wider than a cow path. I was glad this was not my first time at this rodeo. - 1934: 60 years in oak barrels, drier nose, sweet-spice, sweet palate; This came from a barrel forgotten behind a door, according to Francoise! - 1893: mushroom, cellars, flower notes, creaminess, coffee grounds, perfumed flowers, tobacco, dark dark chocolate, oak – 1893 was a big harvest, so many houses had it. 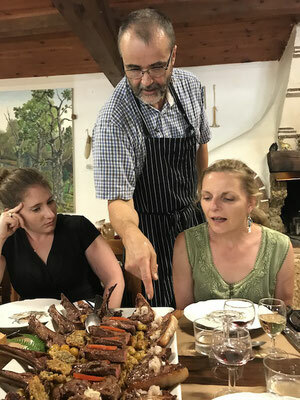 Afterwards we headed over to La Ferme aux Cerfs, a restaurant and game farm, where we dined on fresh stag and boar, raised on site. Before sitting down to eat we had an enjoyable hike through the preserve and had a good look at what would be on the menu. It was a good thing we did that exercise, because the menu we were offered on our return was "quite complete." 3rd course: big tray of grilled steaks of wild boar, fallow deer, and stag, (one of each for each of us) plus a generous amount of gersoises sautéed potatoes. Desert: the famous "croustade" (a flakey dough pie crust filled with apples and armagnac). Did we finish it? Of course we did! Did we have fun in the process? You bet! 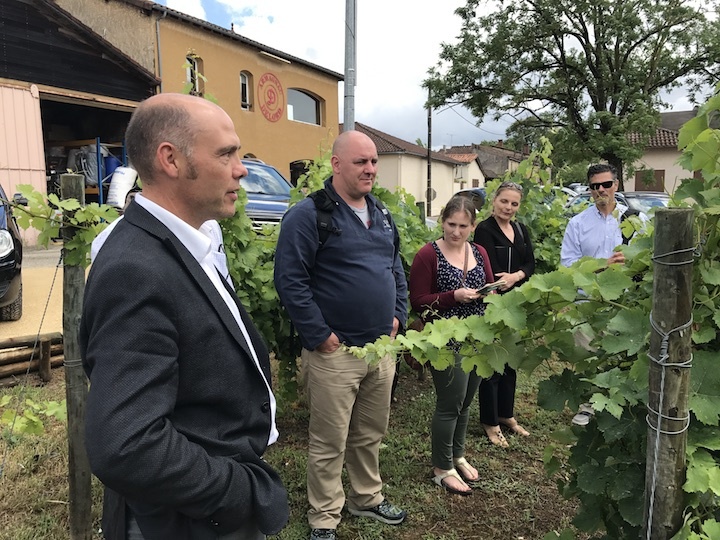 Day 8, part 2 (Wednesday) With our bellies full and our souls content, we headed over to our scheduled appointment with the fabulous Domaine de Magnaut, one of our Côtes de Gascogne wine suppliers. Currently, we only import a small portfolio of wine, as we are primarily French spirit specialists, but the idea was that promoting Cotes de Gascogne wines gives us another reason to talk about Armagnac. Plus, the wines are reasonably priced and beautiful. Cecile and Jean-Marie Terraube are the owners of Domaine de Magnaut and they are passionate about the wine they make. 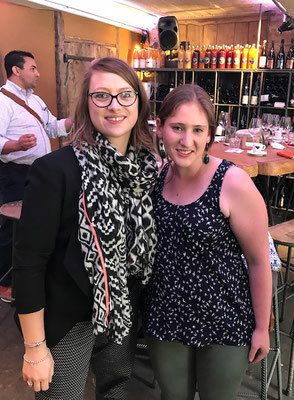 When we showed up for our visit they gave us a tour of the winery and showed us around their vineyards. We loved how they have sample vines of all the grape varieties they use, growing right in front of the tasting room. 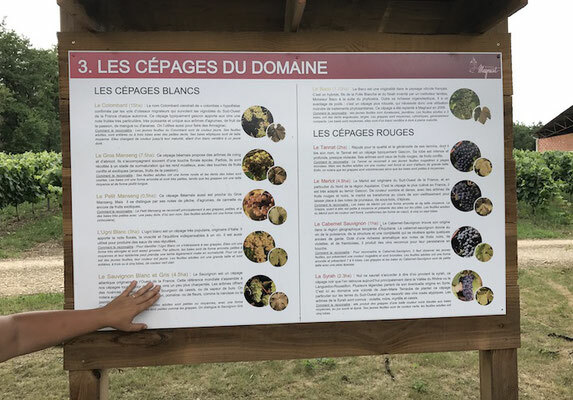 It makes it very easy to talk about the grapes particular to the Gascony region. Examples include: Tannat, Gros Manseng, Petit Manseng, Sauvignon Blanc, Syrah, Ugni Blanc, Baco, and Colombard. 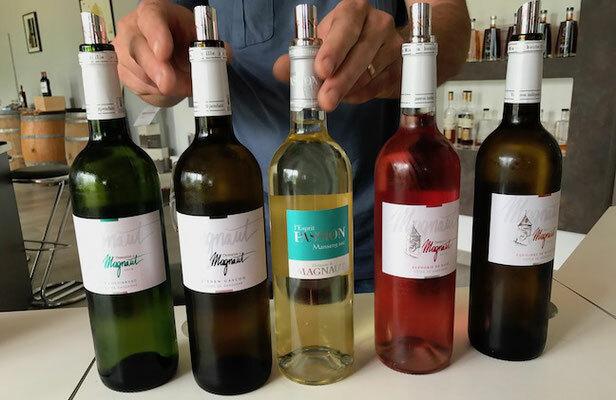 We enjoy selling these delicious wines here in Massachusetts and we’re very proud to have them in our portfolio. We remain open to introducing them to other states that might be interested in distributing them as well. 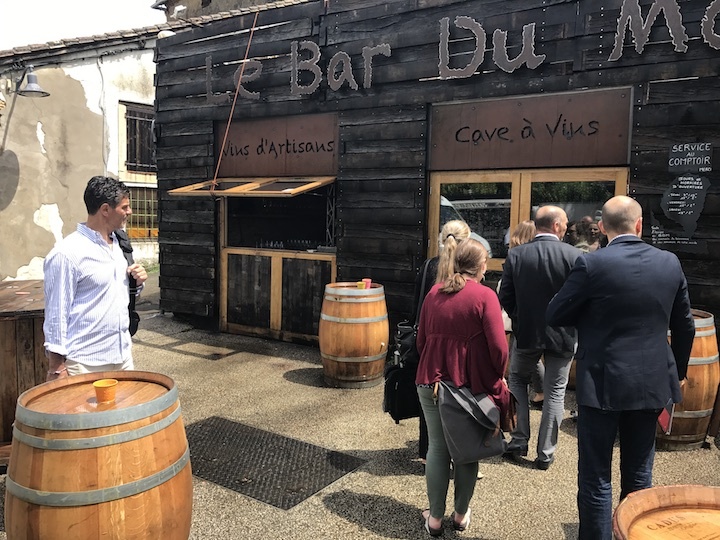 After a full and busy day of touring and tasting, we ended up in the village of Condom, where our group was led into La Table de Cordeliers, a highly-respected Michelin star restaurant, by Jerome Delord and Benoit from Dartigalongue. Once inside the front door, three mysterious gentlemen wearing blue capes essentially “ambushed” our group (in a friendly way) and then ushered us into a side room. 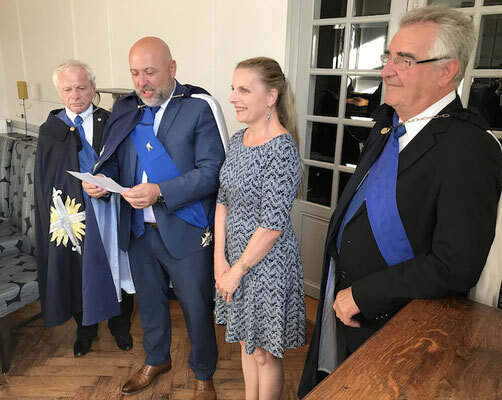 It turned out to be a surprise induction for both Christine and myself into the La Compagnie des Mousquetaires d’Armagnac, making us official Musketeers. 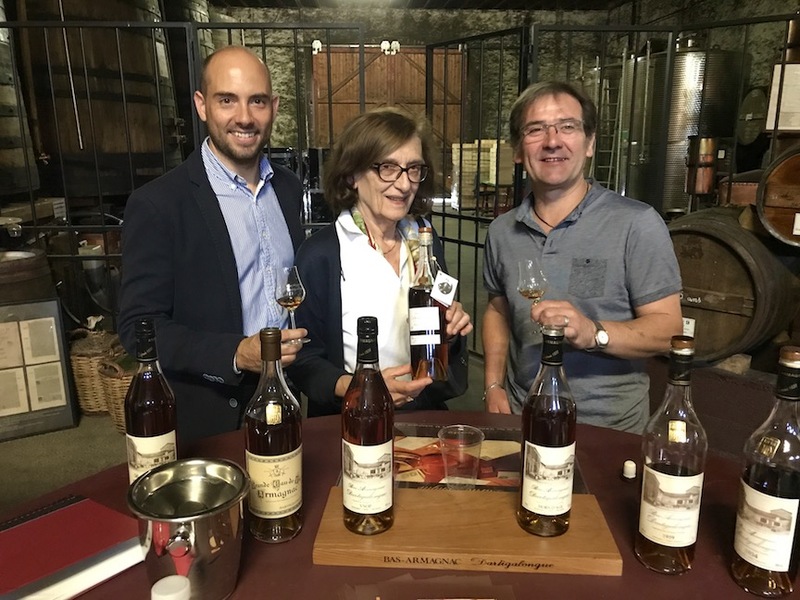 The ceremony was brief, where the Master of Ceremony read a short description of our backgrounds and main accomplishment of being the leading importer of Armagnac to the United States for eight years in a row. 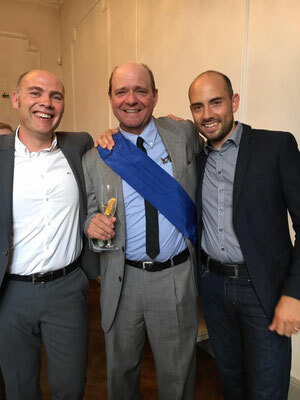 After that we were presented with a pretty snazzy blue sash, bearing a medal from the order of the Musketeers, followed by a toast with our left hands, which I of course in all the confusion got wrong. The induction was a bit of a shock and surprise, but most of all a great honor for our work in promoting Armagnac and French Gascon culture. Thank you Jerome and Benoit! The night was a treasured experience as we then made our way into the dinning room (a converted ancient chapel) and enjoyed yet another amazing meal together. 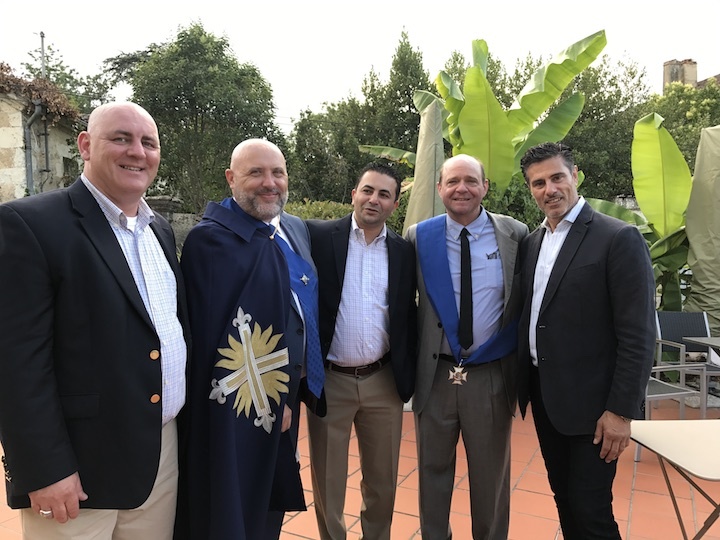 We were happy to learn just two months later, Benoit was also inducted at the annual Musketeer ceremony in September, along with our good friend DG Blackburn and several other deserving devotees. 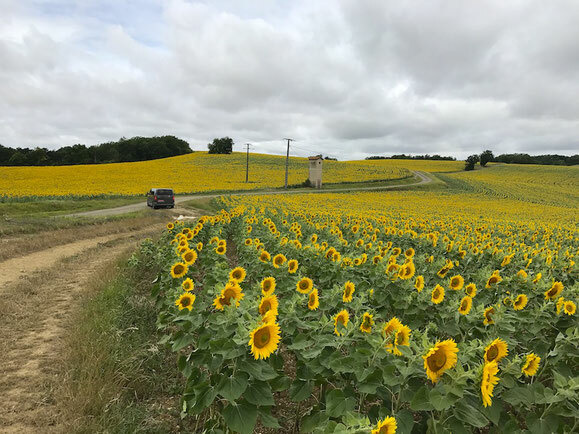 Day 9, part 1 (Thursday) After a good night’s sleep at Jerome’s house, Christine and I picked up our staff, who had the pleasure of staying at Le Castel Pierre, an amazing, recently-restored hilltop country mansion hotel in the village of Lagraulet-du-Gers. The new building has even incorporated walls from the 13th century castle that once stood there. 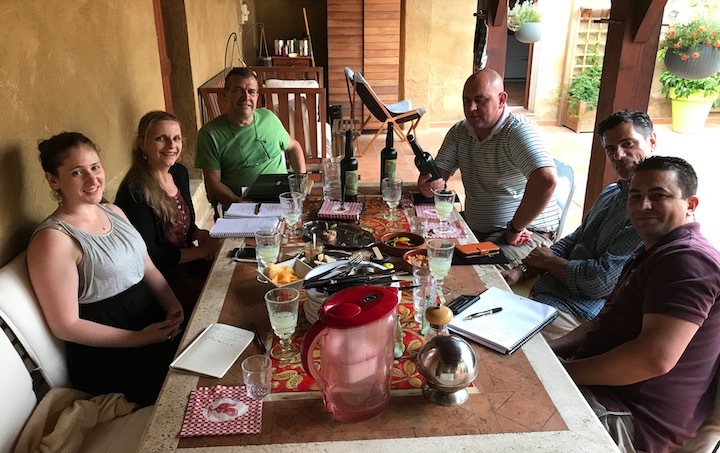 Our team couldn’t say enough about the views, the rooms, the breakfast, the bar, and the friendly hospitality shown by owners, Celine and Julien Vernhes. From there we headed to the village of Eauze, and began the day attending a seminar at the BNIA offices, conducted by Amanda Garnham. Amanda is an educator and I am pretty sure a former fashion model. She has worked with the Bureau National Interprofessionnel de l’Armagnac for many years as their Attachée de Presse. English by birth, Amanda has made Gascony her home and she clearly has a love for the region and all that it represents, which she generously shared with us. 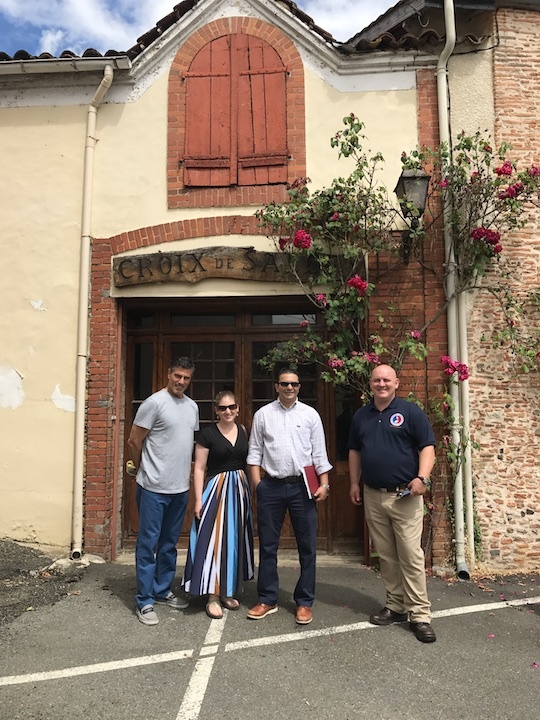 Her morning seminar was designed especially for our group as well as attendees: Jerome Delord, his office assistant, Joelle, and Benoit Hillion. The presentation started with an overview of Gascon history and the origins of Armagnac, supported by lots of relevant facts, such as the percentage of Armagnac distilleries in each designated area: 67% in Bas Armagnac, 32% in Tenareze, and only 1% in Haut. She mentioned that 10 varieties are allowed but most Armagnac is made using the top four: 55% Ugni Blanc, 35% Baco, 5% Colombard, and 5% Folle Blanche. We also learned that a particular grape variety that I was unfamiliar with, outside of the main four, seems to be having a sudden growth spurt, due to its high acid and low alcohol content. It is called Plant de Graisse, and there have even been a couple of instances of it being bottled as a single varietal. She also talked about dry as opposed to humid cellars and "angel share." 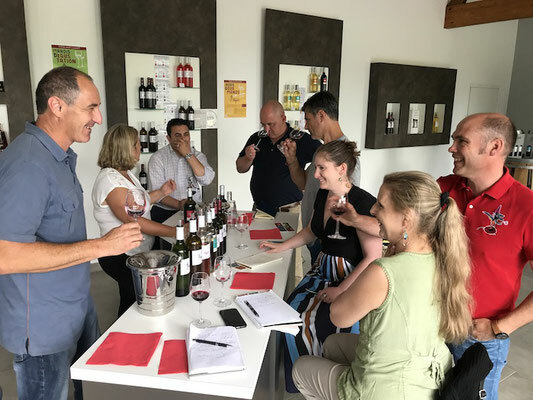 Of course this seminar also included a tasting element and in this case, it was blind, so with our group it provoked lots of speculation and surprises. 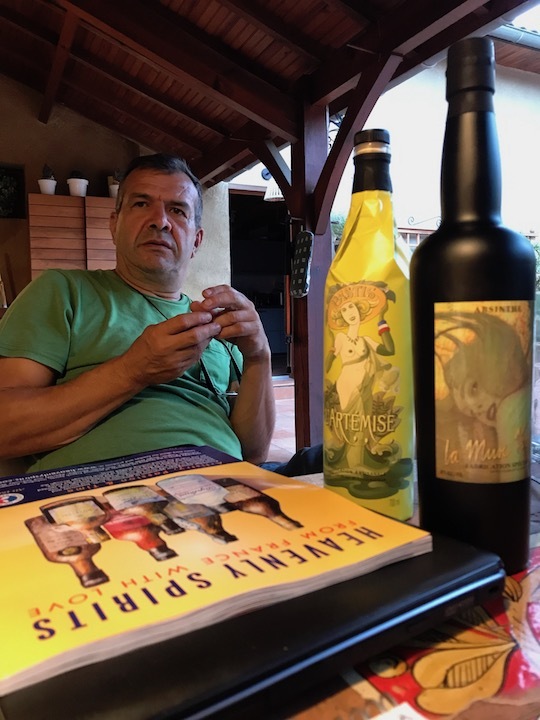 One sample out of the seven that we tasted which stood out to me, turned out to be a VSOP from the Haut area made with Ugni Blanc grapes and bottled at 45% ABV. In fact several of the samples out of the seven were cask strength, but not all of them benefited from the extra alcohol content in my opinion. After two hours of Amanda’s stimulating presentation and tasting, we were all ready for some food, so it was arranged that we would adjourn and walk just down the street for a light tapas style dejeune, at a recently opened bistro called “Le Bar du Marche.” A torrential rain had just slowed to a light summer shower as we made our way down the street sharing umbrellas. A table had been reserved and a dozen menu items had been ordered ahead of time. Jerome, and Christine I believe, chose a couple of wines to share and a good lunch was definitely had by all. 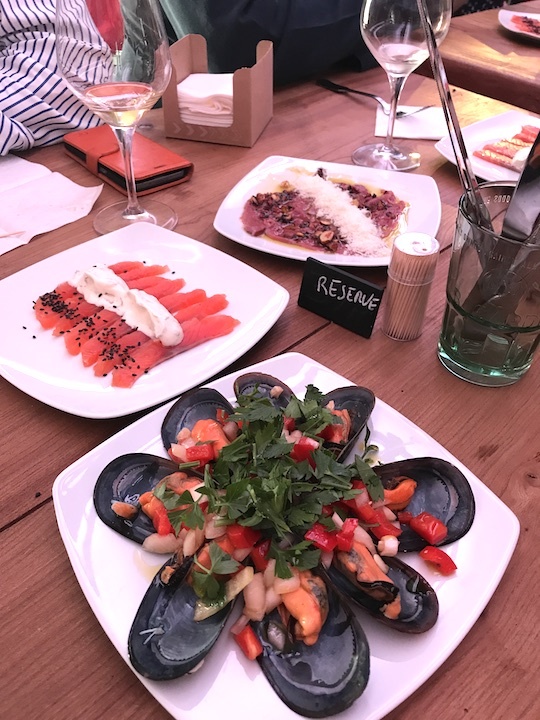 Some of the tapas items we shared include: razor clams, escargot, smoked trout, amazing mussels, and “boeuf” tartar to name a few. The food was outstanding, the service was friendly, and the atmosphere quite convivial, yet everyone wanted to talk about the décor and the bathroom sink (industrial chic and made from a single piece of beautiful wood). Day 9, part 2 (Thursday) After this amazing morning, we headed over to Lannepax where we had a full day still ahead of us to visit with the house of Armagnac Delord. 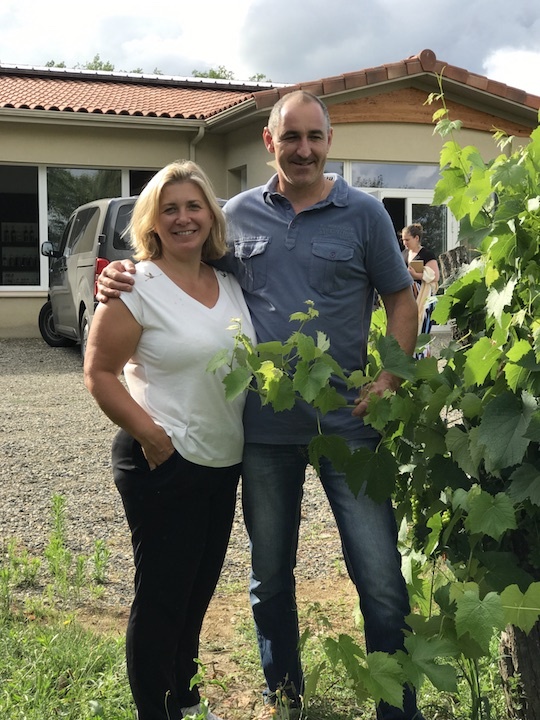 Christine and I have known the Delord family longer than any of our other producers and feel especially close to them as we have gotten to know them like family over the past twenty something years. In fact, when we first came to Lannepax to see what the company was all about, it was being run by a different set of Delord brothers, Jacques and Pierre. I remember how impressed both Christine and I were back then with the dedication, the commitment and the way the whole family worked together to run the business. We both feel very privileged to have worked with the Delords and their team as they have evolved and transitioned over the years. Despite all the challenges that family businesses like this must face, they have actually improved aspects of the business while growing it to become our largest supplier and the number one Armagnac exporter to the US. And they still always make us feel like we are part of the family. That said, it was a real pleasure to share the last stop of our team tour with the Delord family and a full schedule was indeed planned. We started at the offices in Lannepax, where Jerome gave us an overview of the company, before walking us through the buildings. We were soon joined by Sylvain, Jerome’s, brother and partner, who works closely with the never-really-retired Jacques to run the production side of the business while Jerome focuses on the sales, marketing and business aspects. 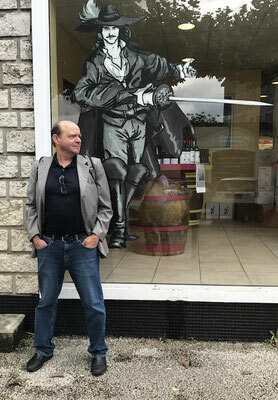 Armagnac Delord is probably the largest business in the small town of Lannepax and it is spread out in different buildings and vineyard locations around the center. 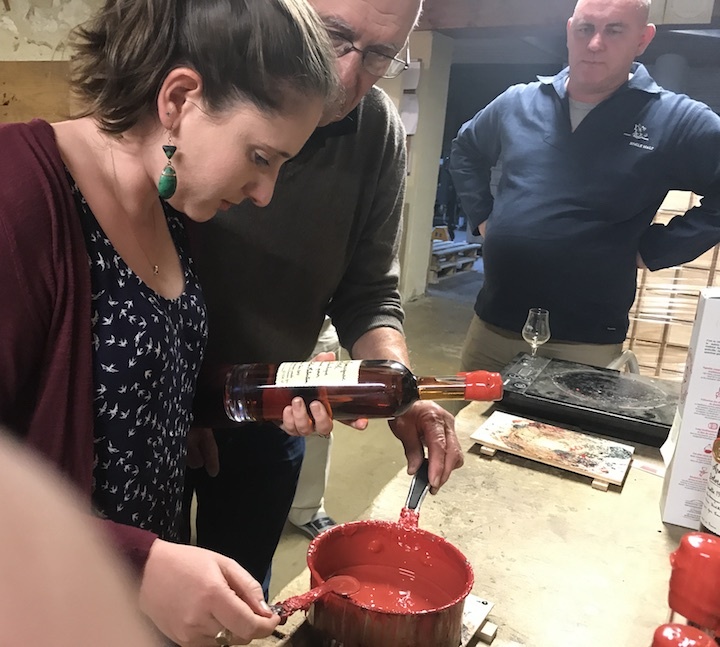 We took this opportunity to see it all, starting with the bottling line, which is not quite as simple as most others, having committed to hand sealing much of their Armagnac with wax. Jacques actually had a surprise wax finishing workshop planned for us later on, where each of us were allowed to apply the Delord seal and dip the cap in wax of their very own souvenir 200 ML bottle of 25 Year Old, hand signed by Jacques with our name on the bottle. A very cool memento indeed. 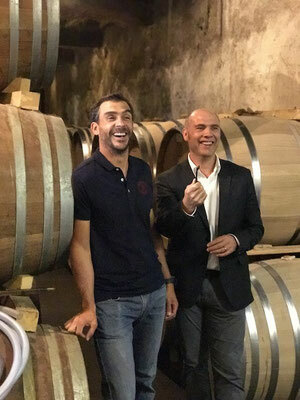 They also showed us the area where they do most of the work of blending, as well as their "paradise," where very old vintages in demijohns rest in the silent darkness. From the main building we walked a block to see another cellar with large oak barrels used to store youngish eaux-de-vie for long-term aging, and then three more blocks to see where the “old Orthes still” resides. 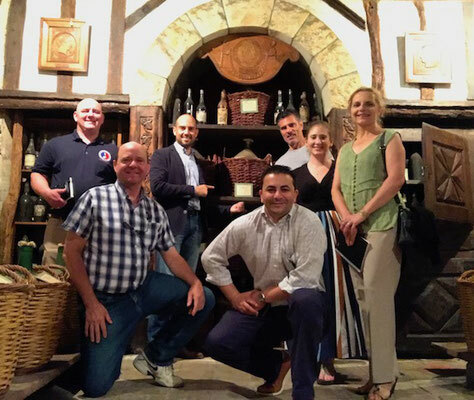 This particular column still is over one hundred years old and responsible for much of the world class Armagnac that we now enjoy. Across from Orthes sits "Cier", the second oldest still of the family. Further out behind the distillery building is the vinification area, with a brand new press and lots of big new stainless steel tanks to hold the wine that will eventually be distilled into Armagnac. We have always believed that making great spirits is an art and so does the Delord family. I believe that is why they commissioned a group of young street artists to decorate one of the larger, older concrete wine tanks with a unique painting. The group did a very professional job and the resulting art work certainly stands out. Our last stop before meeting Sylvain for a special tasting seminar was a tour of two of the Delord vineyards. Located in two completely different areas, one was in a low-lying field next to a small river and the other is very high up on a pitched hillside with a gigantic water tower nearby. No doubt each site has different advantages due to soil and sun exposure. My notes did not include all the details. Sylvain was waiting for us when we returned. 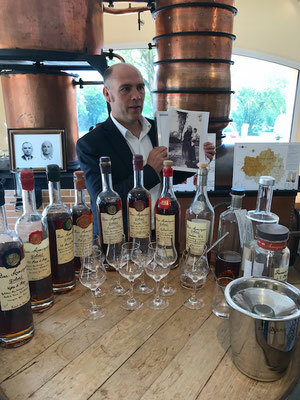 Around a large table on the top floor of the Delord offices he had set up place settings that included at least six tulip glasses, each containing a measured amount of golden Armagnac. 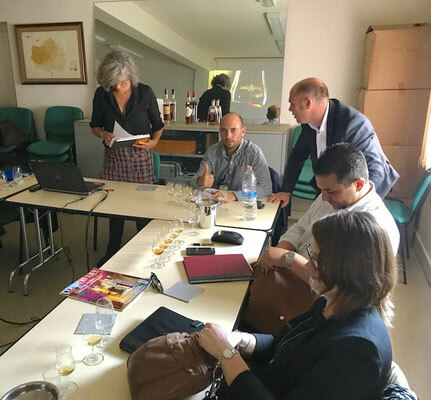 His plan was to run us through the process of selecting the best blend for a new cask-strength Delord, while exposing us to some of the decisions that he often faces during the blending process. In short, we got to play Master Blender for an hour. It certainly was a challenging and worthwhile exercise, and one I think we all appreciated. We finished the day with a fantastic dinner at the recently opened “La Falene Bleue” restaurant, located in Lannepax Center. 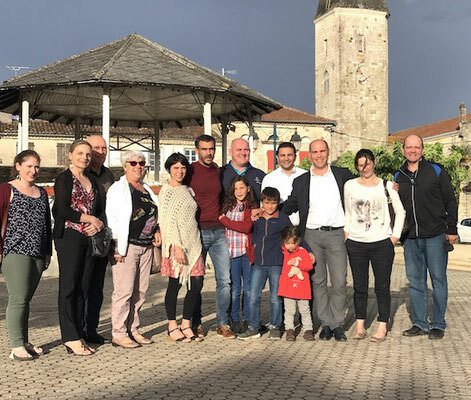 The whole Delord family, including wives and children attended, and it was a wonderful way to end a very enjoyable visit and a demanding yet fruitful tour de France. In the morning, we drove the team to the Toulouse Airport and wished them a bon voyage back to the States. We then headed back to Lannepax to collect our things and say our final good-byes to the Delords. By sheer coincidence, two of our very good industry friends, Hoke Harden and Ms Franky Franky happened to be in the area and we arranged a quick meeting at the Delord offices, where we toasted to the rest of Summer before heading back to our family’s property in La Rochelle. All in all, it was a wonderfully educational trip for our Heavenly staff and a great opportunity for some bonding between all Heavenly factions. Many thanks to all the great family producers who make such quality products and who helped make our tour such an enjoyable experience. 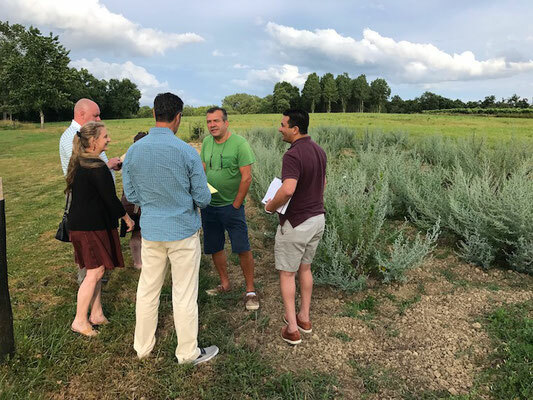 We look forward to continued growth as we keep working together, bringing the love and passion of French culture to the many appreciative corners of the US market. Cheers!